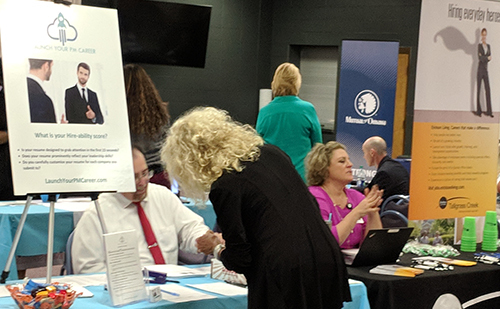 Each year, our Work That Matters team puts together a couple of Job Fair opportunities here at Raytown Christian Church. Our Job Fairs are designed to not only help our local residents find work that matters, but to share RCC’s commitment to connect faith to employment. Our Job Fairs are held in the afternoons and early evenings so that both the unemployed and the under-employed can maximize their job seeking efforts. We pray with the job providers and vendors before we open the event to the public. We believe this paves the way for the Spirit to be well-involved in both the job seeker’s and employer’s efforts. Every job seeker receives some “last minute” coaching and interview tips before they meet a single prospective employer. We pray for every job seeker for calm and confidence before they enter the Job Fair. We limit the number of job seekers on the vendor floor at any one time to ensure each person gets one-on-one attention from each job provider. This allows for more in-depth conversations and interviews – and provides an enhanced opportunity to make a great impression. We provide refreshments and an opportunity for job seekers to debrief in a relaxed atmosphere before they “hit the streets” again after the event. We provide one-on-one prayer for every job seeker before they leave, so that as they depart they go with the assurance that they’re not alone in their search. Our next Job Fair is scheduled for September 12, 2019. Prospective employers: Please call the church office at 816-353-1708 for information on making a reservation – space is limited.